Finnish indie pop stalwarts Jessika Rapo (vocalist for Le Futur Pompiste) and Henry Ojala (ex-drummer for Cats on Fire) teamed up to form the shambly, synthy duo Burning Hearts in 2006. Burning Hearts' debut full-length, Aboa Sleeping, was released on Shelflife Records in early 2009. Aboa Sleeping received a warm welcome and was called one of the top albums of 2009 by Eardrums and other like-minded music blogs. 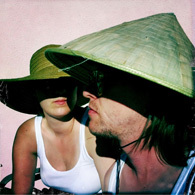 After releasing two singles in 2010, Night Animal, featuring "A Peasant's Dream (Jori Hulkkonen Remix)," and a cover of Arthur Russell's "The Letter," the duo decamped to the Finnish countryside in Ostrobothnia and recorded a four song EP, Into the Wilderness, which was issued by Shelflife in June of 2011. The video for title track "Into the Wilderness," based on a documentary about Alaskan grizzly bears, spread quickly over the web and received a most warm welcome. In July, Burning Hearts was signed by Finnish label Solina Records who, together with Shelflife, will release the forthcoming album.